The Maur Hill-Mount Academy boys celebrate their substate championship on March 3. The Ravens made that Kansas Class 3A state tournament and took their school on a magical run to the final four. For me, the madness began about two weeks ago. No, I’m not talking about my sanity — though it has come into question before. I’m talking about March Madness basketball. 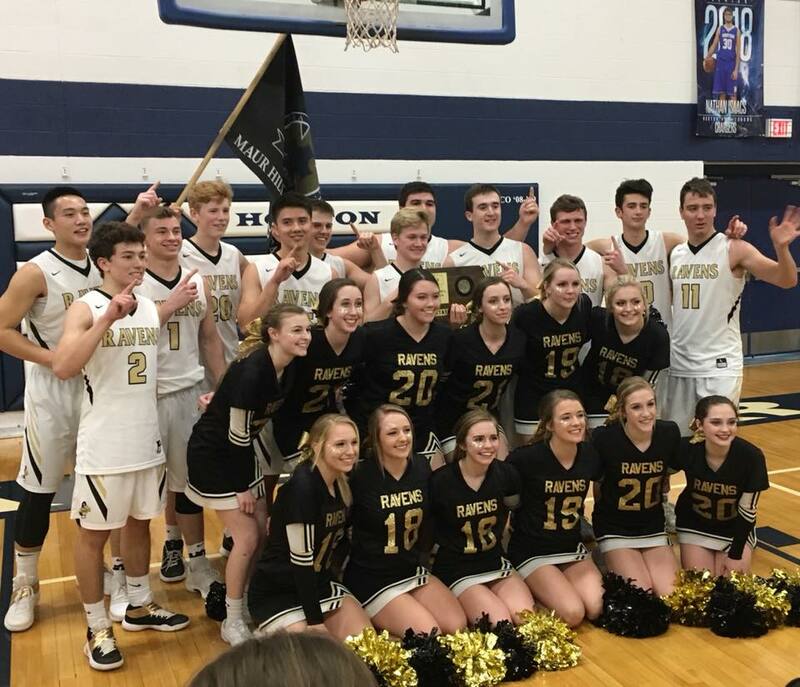 The NCAA tournament is just getting started this week, but for many of our Catholic high schools, March Madness began a couple weeks ago with the Kansas sub-state playoffs. And I had my eye on one team in particular. I’m in charge of an online feature at The Leaven called Team of the Week. I assign photographers to cover various Catholic high school sporting events in the archdiocese. We publish these photos on Facebook and it’s become a very popular feature. One of the first teams we featured for the winter sports semester was the Maur Hill-Mount Academy boys basketball team. Photographer Jay Soldner photographed the boys on Jan. 5 against Jefferson County North High School. The Maur Hill boys ended up losing that game 56-53. In talking with Jay soon after that game, he told me he was impressed by Maur Hill. Seems the team was down by double digits at one point in the game but never gave up and came back to put a scare into Jefferson North at end. I filed that bit of information from Jay in the back of my head and vowed to keep an eye on Maur Hill. After that Jefferson North game, the boys kept winning, and winning and winning. They avenged that Jefferson North loss but putting a 52-37 thumping on them in the rematch on Feb. 16. When substate came around, the Maur Hill boys were given the top seed in their bracket. They took down Atchison County Community High School in the first round of the substate tournament and Riverside High School in the second — both blowouts. Despite their two sub-state victories, a rival coach declared in the Atchison Globe that the winner of the Nemaha-Central-Sabetha matchup should be considered the favorite against Maur Hill in the sub-state championship game. That didn’t matter to Maur Hill; they just did what they had done all season. They won 44-42 to earn a trip to the Kansas State 3A tournament in Hutchison. At state, Maur Hill drew the top seed based on their 22-1 record. Maur Hill played a hard fought game against Council Grove High School in the first round, picking up a 59-56 victory to make the Class 3A final four. Unfortunately that’s where the dream ended. Maur Hill lost to Halstead High School 63-51 and then lost to Cheney High School 62-35 in the consolation game. Although the Maur Hill-Mount Academy boys didn’t win a state championship, they took their fans — and me — on a magical ride. Isn’t that what sports is all about? I congratulate Maur Hill on a wonderful season and look forward to what next year brings. Go Ravens!